Then [Jesus] breathed on them and said, "Receive the Holy Spirit. If you forgive anyone's sins, they are forgiven. If you do not forgive them, they are not forgiven." In the Lord's Prayer and immediately following it, Jesus showed that our own forgiveness depends on our forgiving others (Matthew 6:12, 14-15). In today's verses, he reminds us that the Holy Spirit is crucial in giving the gift of forgiveness to God's community. Clearly, part of the work of the Spirit in this context is discernment and authority to forgive. 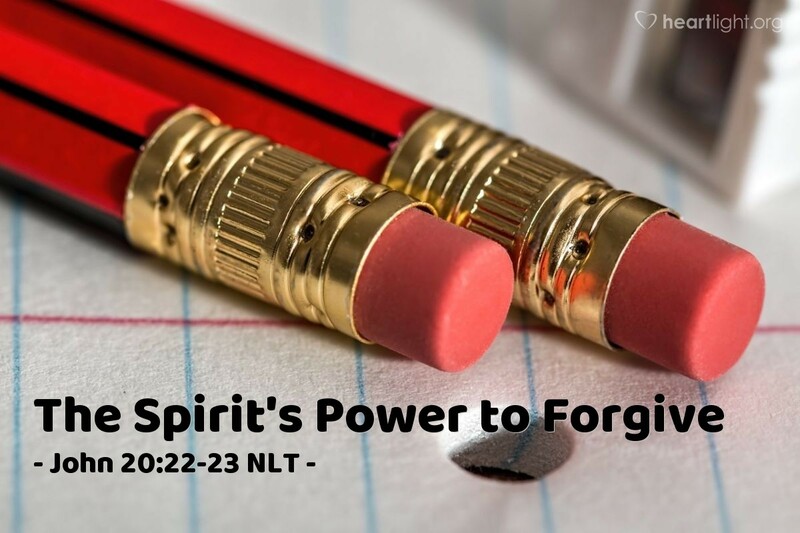 However, the Spirit, who forms Christ in us and brings spiritual fruit to maturity in us, is crucial in our power to forgive. So our prayer should be that the Lord continue to fill us, guide us, lead us, and transform us by his Spirit so that we can truly be his agents of redemption, reconciliation, and grace. Father in heaven, glorious and mighty, I confess that it is often hard for me to forgive the sins of those who have wronged me. Please fill me with your Spirit and help me to be forgiving because I know that I need to forgive others so I can grow to be like Jesus and because my own forgiveness depends on my being forgiving. I do ask for your forgiveness. In Jesus' name. Amen.